James Hume and Eric O'Sullivan celebrate the bonus point win. Ulster climbed to within a point of second place in the PRO14 table with a bonus point win at Dragons on Sunday. But how did the individual players perform? Louis Ludik 5: Was having a typically solid game and gave an assist for Cooney's try. But then came a yellow card and penalty try for the second week running. Robert Baloucoune 6: Will be disappointed not to have got a first half try but did well to help carve out Cooney's score. Only rarely got to show off his blistering pace. Robert Baloucoune makes a break. Darren Cave 4: Not a memorable outing for the most experienced player. It didn't start well with a spilled ball and then there was the yellow card. Stuart McCloskey 7: As usual, he was Ulster's go-to carrier and was often double-teamed by the Dragons. Did well for Moore's try and stopped a Dragons try at the end. Rob Lyttle 5: Some nice footwork was seen and he also pulled off one notable tackle too but then he picked up Ulster's second yellow of the afternoon. Billy Burns 5: Back from injury and it never really looked like a game he was relishing. Some missed tackles and generally a quiet outing in tricky conditions. John Cooney 5: Back from Ireland duty and, frankly this was a mixed bag. Even though he looked out of sorts he but still bagged a try and three conversions. Eric O'Sullivan 8: Enjoyed every aspect of this game. Strong in the scrums he also popped up all over the place to carry or defend. Deserved man of the match. Eric O'Sullivan of Ulster receives the man of the match award from Jamie Blake on behalf of Guinness. Rob Herring 6: No tries this time but plenty of work at set-piece time and in other areas after being pinged early on for detaching from a driving maul. Marty Moore 7: Put in a typically impressive body of work and his strength took him through two tackles to score Ulster’s second try though he left soon after. Alan O’Connor 7: This type of game seemed tailormade for him with lots of physicality required. His reward was the bonus try when Ulster were down to 13 men. Alan O'Connor of Ulster leads his team off after the win. Kieran Treadwell 7: Another who put in a big shift and did some useful disruptive work at the lineout. Carried 18 times, just two behind the main man McCloskey. 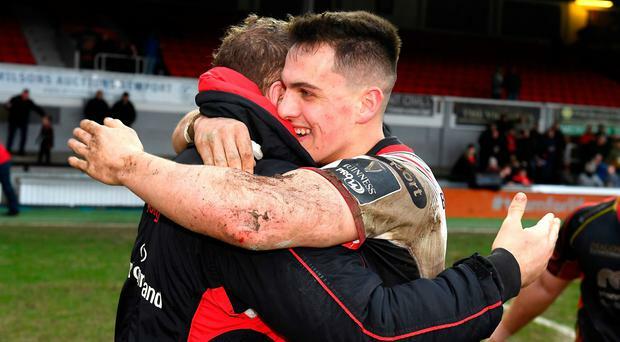 Clive Ross 6: Called up the day before for the injured Sean Reidy, he too made a big contribution to Ulster's ball-carrying on a day for the forwards. Jordi Murphy 7: Like Cooney he was back from Ireland and was given Ulster's opening score though he may have lost control of the ball. Another who grafted hard. Nick Timoney 7: Really visible wth some energetic carries and sefllessly worked on a day of big collisions with Ulster having to deal with three yellow cards. Wiehahn Herbst (Moore 51) 6: Enjoyed his scrum penalty. Dave Shanahan (Cooney 55) 5: A really mixed bag on a difficult day for scrum-halves. James Hume (Cave 62) 6: Dealt with a tricky situation reasonably well. Andy Warwick (O'Sullivan 63) 6: Dug in to help get Ulster get the bonus point. Matty Rea (Ross 63) 6: One really strong carry with Ulster under the cosh. John Andrew (Herring 69) 5: Not a great time to arrive with Ulster down to 13. Ian Nagle (O'Connor 75) 4: Got to kick the ball dead. Peter Nelson (Burns 77) 4: Saw out time.